« Happy Thanksgiving from Metro Home Health Services! The holidays are over. Here in New England, winter has set in and its grip won’t loosen for another month or two. With all that seasonal snow, cold, and darkness, no wonder so many people get the Winter Blues. Fortunately, there’s a lot that can be done to combat the gloom that has been clinically identified to affect some individuals as Seasonal Affective Disorder, otherwise known by its aptly-associated acronym, SAD. Many of us are simply annoyed by winter’s challenges, especially as the weeks and months drag on and our arms grow sore from shoveling, but a certain percentage of the population afflicted with SAD find that the lack of natural sunlight in the winter time upsets the sleep-wake cycle and other circadian rhythms, as well as the release of serotonin, one of the brain’s “feel-good” chemicals. Fortunately, SAD is less common in individuals over 55, but the senior population may still suffer from depression at this time of year, and that can lead to increased stress for caregivers and the elderly alike. Whether you’re a senior or caring for a senior loved one, here are some tips to help you beat true seasonal depression or depression that just happens to occur during the winter months. Despite the shorter days, the sun still shines. If weather permits, seniors can be outside and soak up the sun – it’s good for the body and soul. Just because it’s cold doesn’t mean seniors can’t venture out, they just need to dress properly for the weather. That means hats, and gloves or mittens and not leaving any bare skin exposed for long, since seniors are especially susceptible to frostbite. Are physical limitations truly preventing you or a loved one from getting outdoors? Even just looking out a sunny window can boost a blue mood. Exercise has been proven to improve mood, increase mental sharpness, and decrease susceptibility to illness. 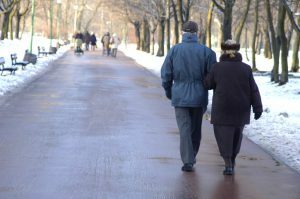 For seniors who enjoy walking outside, many find indoor walking this time of year a good substitute and a positive change of pace. Many malls open early to seniors and enable them to walk in a safe, temperature-controlled environment. Senior centers can also be a source of exercise, both individually and in groups such as yoga and light stretching classes, or other programs designed to help seniors stay active. After the holidays, many seniors may feel overwhelmed and want to have some downtime from social activities. While temporary downtime may enable seniors to recharge, a caregiver should be alert for a chronic disinterest in social activities that they previously enjoyed. Having lunch with a friend, going to a movie, or continuing with hobbies are great ways to help fend off the blues. While it is always important to eat healthy, the dark days of winter tend to create cravings for carbohydrates in the form of sweets. While sweets can provide a short term boost in mood, in the long term they only add weight. Soups and stews made with lean meats and vegetables provide a good source of protein while providing complex carbohydrates and a warm, comforting meal to keep seniors feeling full. Winter is cold and flu season and this year has been an especially tough one for the flu. Simple preventative measures such as washing hands frequently for 20-25 seconds is a good start to fighting off the flu. Seniors and caregivers alike can still benefit from getting a flu shot. Wiping down doorknobs, remotes and phones with antibacterial wipes, also, stops the spread of germs. More than anything, beating the Winter Blues is largely about keeping a positive attitude. While it may be cold and snowy outside, it’s also beautiful, and a time of the year when things can slow down, providing time to relax, read, catch up with old friends, and enjoy being warm and cozy indoors. Remember, Spring is just around the corner! This entry was posted in Caregivers, Tips and tagged caregivers, senior, winter. Bookmark the permalink. Comments are closed, but you can leave a trackback: Trackback URL.